Ashburton Grove - Arsenal news and Arsenal opinion: RVP in no rush over new contract -Deal in place for Spanish under-21 star? RVP in no rush over new contract -Deal in place for Spanish under-21 star? Unsurprisingly one of the players who stopped to talk to the waiting media in the mix zone following Saturday's victory was Robin van Persie, the newest member of the Arsenal one hundred club. Robin was no doubt in a good mood following his brace against the Trotters. The mood in the dressing room must have been better as well with all the players and the manager feeling under the strain because of their poor start of the season. But it was the captain's job to try and help the situation and in his programme notes, the Dutchman revealed exactly how he did that. "We had a really good team dinner on Wednesday evening as well, and that’s great for the team atmosphere too. "Most guys were dancing and everyone really enjoyed it. So all the fans should know that we are happy, and united together as a squad, confident, and really looking forward to this match." You could see it wasn't until the second half when Arsenal started moving out of the blocks and through the gears. And it was van Persie himself who took responsibility to shoot after Aaron Ramsey brought the ball into the heart of Bolton's defence to slip the captain in. The captain's second was class. Ramsey involved again with a ball to Walcott who fired in low for van Persie to tap home. It looked easy but I don't think it was. But it was the captain who showed responsibility to take these opportunities when Arsenal's confidence must have been shattered by last weekend's defeat. Getting back to winning ways was vital. The manager has already said we can't afford to lose many more games but by winning we're go into the next two games with a little more confidence and the knowledge we still do have the ability to win games. So fast forward to post match and RVP is in the mix zone. One of the questions all the journalists are going to ask is about whether Robin will be starting the process of talking to the club about a new deal. Unsurprisingly given what's just gone on in the past few months, the Dutchman was non committal about a new deal. "I’m happy with my contract, I’m good. That’s how it is, I can’t say much more. I can’t look into the future. "The main thing for me is the team and that we play well. I do believe you have to look for a right moment to sit down and speak about your own stuff. It’s not only about me, it’s about the team. "I don’t want to give the wrong message to speak about my own stuff while the others are a bit more important. "I can’t say we are talking now because we are so busy – we have games every three or four days." Personally I don't buy the too busy line. We know that Darren Dien is Robin's new agent and he has successfully concluded deals for Cesc and Clichy away from the club this summer. I'm sure if Robin wanted to start contract negotiations he would instruct Dien to. The Daily Express report he's sold his house recently, but perhaps that's because he found somewhere nicer to live. But I can understand him wanting to wait. I would want to see where this team were going were I in the same position. Why sign a new deal now when you don't know whether the team are going to be successful? The summer must have left the squad feeling down. They knew Cesc and Nasri were good players and they were both moving on. But until the new signings are given a chance to bed in, then we can see how we're going to do this term. This will be Robin's last major contract. Can we match the wages he'll want? Will we have to break our £90k ceiling for him to stay? Something else we have to consider. Martin Keown writing in the Daily Mail says Robin is right to want to wait. 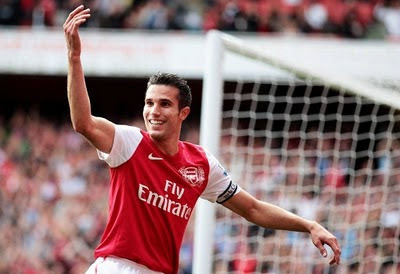 Arsene Wenger doesn't believe van Persie's situation is similar to that of Cesc and Nasri. "If you're in Robin's place and you see Nasri going and Fabregas going, then you can be worried. "We lost Fabregas not because of a financial reason but because of an understandable reason even if it hurts us a lot. "But Robin is not from Barcelona." The other thing to consider is van Persie's age. He's 28 now and will be 30 in the August of 2013, a month after his deal is due to expire. I expect fitness will also play a role in the kind of deal the club are prepared to offer him as well. Robin has been committed to the club but the club have also shown great loyalty to him as well. He's been through some tough times in the past in his personal life and his playing career, spending many months out through injury. Hopefully we've seen the back of those times. Robin has looked fitter since his last injury and his goal record - 26 goals in 31 games in 2011 - can't be beaten in the Premier League. "He is like Lionel Messi in the positional sense. He doesn't play like a real centre-forward but if you look at his movement he is very intelligent. because of his diagonal runs. "And his first touch is so good that in tight spaces he can make a difference, also because he has a very short back-lift for a big guy." If van Persie was able to stay fit for a whole season, I think we'd see his true brilliance come through week in, week out. It's just unfortunate that he's been out injured for so long. And if you haven't had enough of RVP, take a look at our Inside The Formation post about the Captain's role in the 3-0 win over Bolton, with video highlights of his performance. Elsewhere, the Daily Mail report we're negotiating the signing of Spain under-21 international Daniel Parejo from Valencia. And the Guardian report what you've read here yesterday that Arsenal believe Theo Walcott's injury is minor and he should be available for selection on Wednesday night.